Log into your account dashboard. 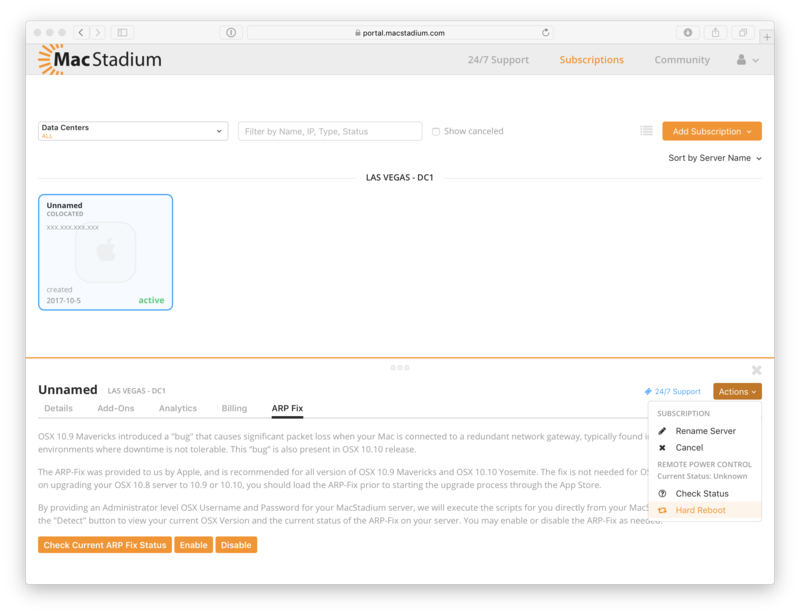 Select one of the colocated Macs that you would like to check the ARP fix status of, or if you would like to enable or disable the ARP fix on. Click on the “ARP Fix” tab for the selected Mac. From here you can check if the ARP fix has yet been applied to the colocated Mac, or enable and disable it. 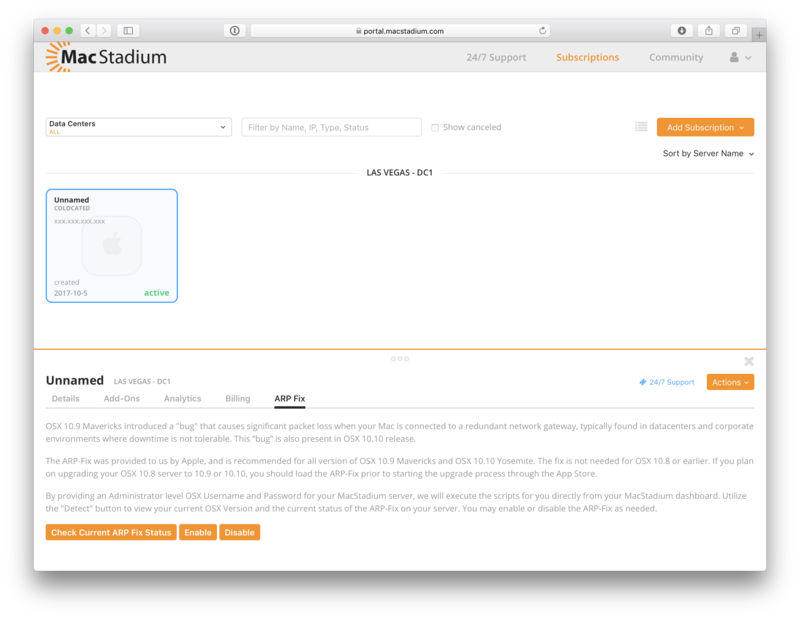 Verify the IP address of the Mac you would like to detect the ARP status for and enter your username and password. This will allow us to check whether the ARP fix is enabled or needs to be installed. You’ll receive a response with the current OS X version and the ARP-Fix status. If you receive an error, verify that the computer with the chosen IP address is online and that your username and password are correct. Then, try checking the status again. If the status is Enabled, you’ve got nothing else to worry about. Please open a support ticket if you are still having network connectivity issues. If the status is Disabled, please click the Enable button to apply the ARP-Fix. After a few seconds you will receive a response that it was successful and that your server requires a reboot. You can do a software reboot by logging into the Mac as you would normally through RDP, VNC, Screen Sharing, or SSH. An alternative to that is to do it directly from the dashboard you’re already looking at. Navigate to the Actions button on the right for the selected Mac and click Hard-Reboot in order to hard reboot the power outlet your server is plugged into. 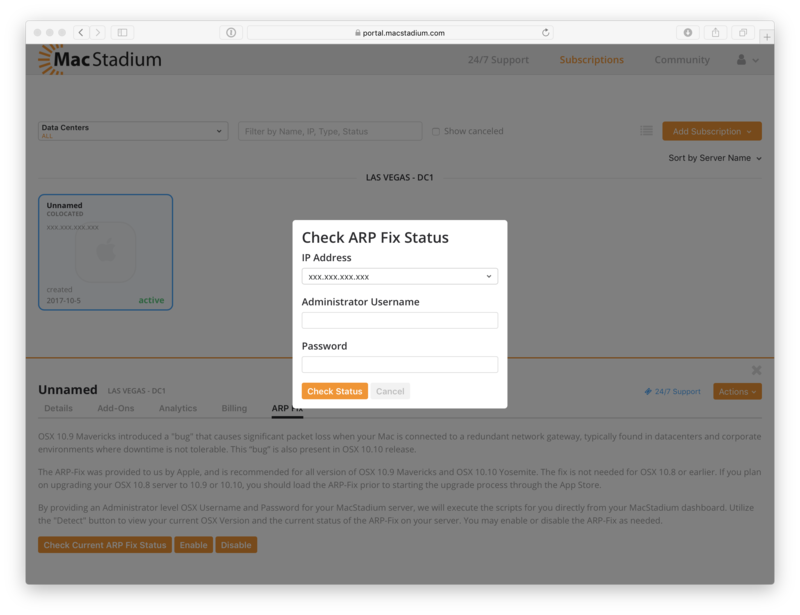 After waiting 30-60 seconds for your server to come back online fully, navigate back to the ARP-Fix page and detect ARP-Fix status once more. You’ll receive a status of Enabled and then you’re done.